Your cultural itinerary includes sights like Biltmore Estate and Walker Sisters' Cabin. 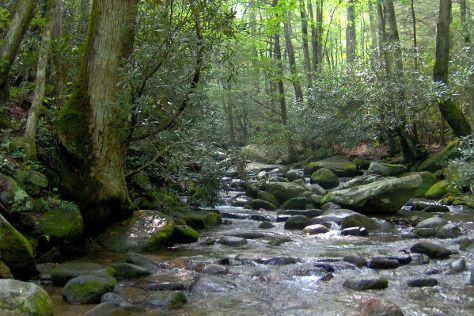 Kids will appreciate attractions like Roaring Fork and Ripley's Aquarium of the Smokies. Change things up with these side-trips from Gatlinburg: Great Smoky Mountains National Park (Cades Cove, Clingmans Dome, & more) and Basilica of Saint Lawrence (in Asheville). Pack the 16th (Fri) with family-friendly diversions at The Island in Pigeon Forge. There's much more to do: find something for the whole family at Dollywood, take your sightseeing to a higher altitude at Mount LeConte, get a taste of the local shopping with Fowler's Clay Works, and cruise along Newfound Gap Road. To find other places to visit, photos, maps, and other tourist information, you can read our Gatlinburg online visit planner . In November, plan for daily highs up to 60°F, and evening lows to 39°F. Finish your sightseeing early on the 16th (Fri) so you can travel back home.